Marquees: Who provides the power? In marquee hire there are a few common problems you face – one is the question of who provides the power? I’m not thinking of your lighting (as obviously you’ve got to run that power supply) but what happens when the DJ turns round and says where’s his power? Or the caterer, or the bar..
Mal at Premier Party Tent faced exactly this issue recently and to be honest it is a little tricky. You can’t be expected to wire up the marquee like a factory with sockets anywhere required but at the same time most customers would expect the marquee man/lady to sort everything out. My suggestion is to sort it out in advance. When you take the booking ask the customer if there are going to be any other power requirements, if so how much power do they need? You then charge a set amount per extension lead. If you leave it until you’re on site it could look like you’re trying to subtly get the bill up a bit (this never ends well) or you may feel obliged to provide them for free (unless it’s in exchange for tea or food this isn’t so good either). One extension lead can take up to 3KW of power, this is normally enough for a DJ or bar but rarely for caterers. Tea Urns are 3KW each and often they’ll have 2 of those plus ovens etc so consider a generator or getting an electrician to connect a large supply across for large events. You shouldn’t be running more than 3 or 4 extension leads from a house, any more and consider a generator or an electrician. Also when running several power leads plug them in to different areas of a house so they’re on different circuits. A long extension lead from Wickes etc is quite cheap but long term you really want to be using blue arctic cable leads with 16amp connectors. The connectors are splashproof so you can leave them outside as long as they’re not on the ground and you just daisy chain leads together – terminate the lead with a 4-way standard 13amp socket adapter for the bar/DJ and plug in to the house using a 13 amp plug with an RCD to a 16amp connector. If you don’t have RCD’s built in to your leads buy some adapters for them, these protect anyone if a cable’s cut through. These really are a must in the marquee hire industry. If you’ve got the right kit then running power to a marquee is easy though not hugely lucrative. If you’re scratching round getting different extension leads and trying to weatherproof a normal 13am reel extension lead then it can be a bit of a nightmare. Ask your customer their power needs in advance and charge for your work. PS the marquee and some red, green and honeybeige once used carpet is on eBay (there’ll be more carpet to follow). It’s the middle of the season, you’ve had to work on Saturday due to a particularly large and tricky marquee job and now you’ve finally got to relax on a Sunday afternoon with your feet up watching TV. Suddenly your mobile goes off and one of the lads who works for you wants to know what marquees are going up on Wednesday as he’d like to knock off early. Or maybe a customer’s calling to add another table to their booking in 3 months time. If you’re like me and it takes you a while to wind down then this is quite literally the last thing you need. Not everyone’s like this – I’ve got a mate who also sells marquees who can happily answer his phone on holiday and not let it ruin his day. Not me. And if it’s not you then the solution is very easy. Have one for your friends and family that stays on most of the time and one for work that you turn off when not at work. When contracts are as little as Â£10/month or even pay as you go there’s really no reason not to (other than the pain of carrying two mobiles).  Keep your personal mobile number a treasured secret while your work mobile can be on your business cards and website. If I’m working in the evening or at weekends, my work mobile’s on – as a lot of you will know I’ll talk about marquee hire all day! But when Mickey Mouse Clubhouse (my daughter’s current program of choice) is on, the work phone’s off. Trust me, this really helps. My only exception to this would be when you first start up. I’m fortunate enough to (part) own a 30 year old company that’s widely regarded as one of the market leaders. When you first start up you’re not so lucky (unless you’ve parted with a wedge of cash! ), you need to stand out for your service and reliability -I’m afraid having your phone answered out of hours is one way of doing it. Just remember to turn it back on again afterwards. -I’m playing around with the comments section. I disabled them when I was getting too much spam from it (200 daily!) but hopefully it’ll be working soon. -I’ve finally updated our gallery with some photos so pop in if you need some new ideas, there’s a few of our marquees used to replace a church in Nigeria! Regular readers (thanks Mum) will have noticed that I described the thinking behind planning my brothers wedding marquee a few months ago but then haven’t really mentioned it since. Anyone who tried to get in touch with me over the last couple of weeks will have realised that the wedding did indeed go ahead so why the lack of descriptions/photos? Well the answer’s a little embarrassing. The guy who bought our old marquee hire business wanted to supply a marquee -I think he felt guilty as we sold it to him too cheaply! I on the other hand wanted to make it a show setting to display everything you can do with DIY Marquees. This shows one of our experimental 6m x 6m entrance marquees with red carpet (the green went across to the toilet unit). We’ll probably put this 6×6 on eBay this week as I don’t think we’ll make it a standard stock item -it uses 50mm dia powder coated poles and I’m not a fan of either (50mm’s too heavy and powder coating doesn’t age well). This shot shows one of our marquees with the 12m wide marquee in the background. Anyway, make sure you hirers come along to our stand at the Showmans Show in October and we should have some interesting stuff for you to look at. So you want to start a marquee hire company? Congratulations, a wise choice.But where to begin? Research: You need to look into who you’re targeting, what competition you face and the quality of marquees you want to buy. Target Market: Weddings, parties, country fairs or maybe all 3. Weddings require a better quality finish (interior linings, flooring etc) than country fairs who generally just need a cover out of the rain. Your competition: Check online, check yellow pages, get your competitors brochures or any literature you can to see what they offer -don’t introduce yourself yet, you may want them to come and do a site visit for you (I’ll expand on this later). Quality of marquees: The quality of marquees varies greatly, though mostly it comes down to the thickness and type of material used in the roof (walls are less important). You should also consider upgrades -if you want to expand into the wedding market you MUST be able to offer linings. Finally you need to consider what your budget is likely to be. Put together all the costs, how much you can charge per hire (slightly less than your competitors I’d suggest) so that you’re aware of how many hires are required until you’re in profit. 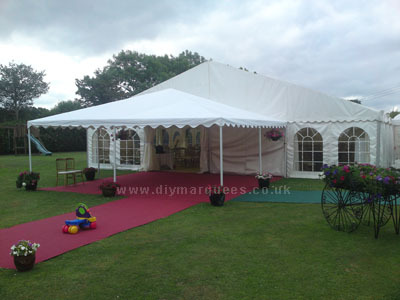 We believe our DIY Marquees are the ideal entry level into marquee hire. They offer excellent returns on investment whilst being suitable for any event – unlined marquees for fairs & fetes or add a lining for parties and wedding marquees. Posted in marquee hire advice, starting out | Comments Off on So you want to start a marquee hire company? Apologies for the lack of writing last Monday, I’ve been away the last week and ran out of time before we left. If anyone complains about being worn out from putting up marquees try travelling all day with an 18 month old daughter! Which actually leads me on to my advice today. Marquee erectors are renowned for living on junk food. Local kebab shops, sandwich bars and burger joints used to know our lads by name. One sandwich shop actually named our sandwich of choice the ‘cholesterol killer’ – thick white bread with bacon, chips, melted cheese & mayo. This is all well and good if you’re a teenager but when you’re the wrong side of 30 (join the club) this sort of eating can make you suffer. If you’re coming home at night shattered just take 5 mins and run through what you’ve eaten, maybe some healthier eating could help. I’ll be back to my usual mundane stuff next week! If you’re starting a marquee hire business, you need to plan and have knowledge of when’s the busiest time of year. It seems obvious – summer. end of blog. More specifically peak season for most hire companies is from the middle of May to the middle of September. Business will build up and fade away from those points but those are the peak dates. Students don’t finish until mid-June, so that means you’ve got several weeks until you can call on your typical source of extra labour. 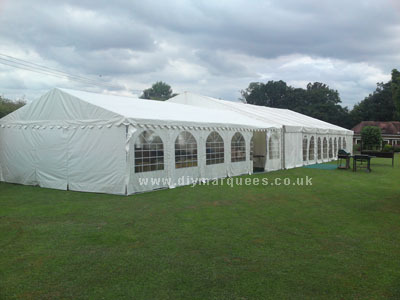 Marquees are becoming more popular during the winter as people realise heating systems have improved. Whenever you’re planning a winter event for someone their number one priority is to make sure it’s warm – plan for plenty of heaters. As word gets round that you supply wamr marquees during winter time you’ll find business picks up in your off-peak months (you may have to offer discounts or incentives to make sure). When we ran a marquee hire business my dream was always to have a large yard with everything loaded by forklifts. It strikes me as the most efficient way of running the business and we were probably a year or two away from accomplishing it when I had to ‘retire hurt’. So is this what you should aim for in the long term? Well now I’m not so convinced – if you save up for a commercial property the costs don’t stop there, you have to pay council tax at 40% of the estimated rental income. To give you some idea if you’re paying Â£15k rent for a commercial unit you then need to find another Â£6k for council tax (even if you actually own the unit and don’t rent you still have to pay council tax). So what’s the solution? Well it depends on where you are on the size scale for a marquee hire business. If you’re just starting out or you’ve only got a handful of marquees then I’d always recommend using your garage, shed or a trailer for storage. Make sure you don’t upset your neighbours so they don’t compain about you running a business from home. If you’ve outgrown your garage/shed then you need to find somewhere else to store your equipment. If you’re offering furniture and dance floors it won’t take long before you need to find more storage. My advice is to approach local farms and see if you can rent one of their buildings. Rent is generally cheap, they probably won’t have planning permission for commercial use so again you want to keep a low profile but it does mean you won’t have to pay council tax. Make sure you use your own padlocks -barns will never be as secure as commercial property or even your garage. First off don’t worry. It’s incredibly rare to have any problem and even then they’re generally minor things. The marquees blowing away – make sure they’re always well anchored down. We never had this happen to us and I don’t know any hire business this has happened to. Not being paid for the job. If you take a small deposit but then have the balance payable when the marquees up but before it’s used then you never have any bad debts (don’t allow any exceptions). It’s easy getting payment when you can still take the marquee down, if you leave it until after the event you have no leverage. Realistically the only problem we really encountered (and to be honest it did happen a couple of times a year) is the customer complaining that the marquee roofs are dirty. If you put a marquee up under a tree when it rains all the dirt drips down off the leaves on to your marquee, this is the main cause of dirt building up. If it’s in your busiest time of year and it’s going straight back up you just don’t get time to clean it. The solution? We’d give the customer a roof lining for free.This covered the dirty roof and the customer’s also happy because they’re getting a higher spec marquee than they’re paying for. I was always reluctant to knock money off to solve any problem, you end up haggling and compromising so neither of you are happy and it leaves a bad taste in the mouth. Are people going to recommend you afterwards? At the end of the day a happy customer has always got to be your goal, you need to do whatever you need (within reason) to make sure every customer is happy. You’d be amazed, some of our best recommendations came from people who’d originally complained but we’d sorted it out for them. I’m a firm believer that you see the true side of a business (and a person) when things go wrong, make sure you react well and your reputation will only benefit from it.